Mitsubishi Chemicals is working towards OLED materials together with UDC. They have also entered the OLED Lighting market together with Pioneer in February 2010 and are selling OLED panels under the Verbatim brand (Verbatim is owned by Mitsubishi Chemicals). Mitsubishi Heavy Industries has decided to start making OLED display panels back in 2007, although we did not hear about these efforts since. Mitsubishi Electric are producing the world's largest OLED display, the Diamond Vision OLED. These are modular displays that are made from 128x128 PMOLED tiles. Those displays are already available and the first one was installed in 2010 at Merck's Material Research Center. Mitsubishi Chemical and Pioneer announced that they developed a bluelight-less OLED lighting panel. The OLE-P0909-C3S module which contains this panel is actually already shipping, and it is produced using the wet-coating process developed by the two Japanese companies. The new panel emits a minimal portion of blue light - less than 1% of the amount emitted by Mitsubishi and Pioneer's regular 3000K OLED panel. The panel is a candle-color type - with a 1900K color temperature. The module size is 92.4x92.4 mm (active area 76x76 mm) and is 4.3 mm thick. The maximum luminance is 3,000 cd/m2. 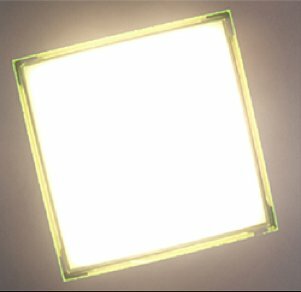 In early 2014, Pioneer and Mitsubishi Chemical announced that they began to mass produce OLED lighting modules made with a "wet coating system". Soluble OLED processes should offer a great production cost reduction - but Mitsubishi's panel suffered from limited lifetime (15,000 hours). According to a new report from Japan, Mitsubishi managed to double the lifetime, and their newest panels offer 30,000 hours. This was achieved by new longer-lasing OLED materials and a different device structure. Mitsubishi already shipped panel samples to lighting equipment makers and will setup up their marketing effort soon via their Pioneer JV (MC Pioneer OLED Lighting). A few days ago Pioneer and Mitsubishi Chemical announced that they began to mass produce OLED lighting modules made with a "wet coating system". The two Japanese companies estimated that the new process will reduce the cost of the OLED panel by 90% compared to the current production method. Today I found this nice video showing two new OLED luminaries (the Wireframe and the Magic Tiles Nine) designed by Ely Rozenberg and Mauro Del Santo. This project was organized by Pioneer, Mitsubishi and +ISO and those are apparently the first lamps to use Pioneer's new printed OLED panels. 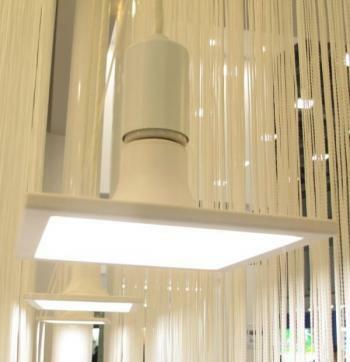 Pioneer announced that they began to mass produce OLED lighting modules made with a "wet coating system". The production technology was co-developed by Pioneer and Mitsubishi Chemical. The panels will be distributed by MC Pioneer OLED Lighting Corporation. The two companies currently produce a single module that is 92.4 x 92.4 mm in size (active area 76x76 mm) and 4.3 mm thick. It weighs 42 grams. The color temperature is 2870K and the maximum luminance is 3,000 cd/m2. Unfortunately they did not reveal the efficiency and lifetime of this OLED. Mitsubishi Electric demonstrated a new OLED lamp that supports the regular E26 ("medium") incandescent socket. This is not the best design for an OLED of course, but Mitsubishi says that one day such a design may be used to replace regular incandescent, CFL or LED lamps. The OLED is 16x16 cm in size (8 mm thick). Mitsubishi did not reveal any specification on the panel - only that the OLED itself wasn't actually produced by Mitsubishi Electric. The lamp can be rotated independently from the base - so you can change the angle (or rotation) after you screwed the lamp in (this is because the OLED isn't round like normal incandescent or CFL lamps). In October 2013 Mitsubishi Chemical and Pioneer announced that they plan to start producing printed OLED lighting panels in 2014. Now Verbatim announced that it will bring an OLED panel produced using a "web coating process" to the Light + Building exhibition in April. Verbatim will also demonstrate a flexible OLED lighting panel for the first time. We don't have any more information regarding Verbatim's new panels. In October 2013, however, Pioneer and Mitsubishi said that their panels use coating only for the bottom layer, while the emissive and top layers are deposited using VTE. Mitsubishi Chemical and Pioneer have been jointly developing OLED lighting technologies for a long time, including printed OLED panels. The companies are currently producing OLED lighting panels in which the bottom layer is coated and the emissive layer and the top layers are deposited by evaporation in vacuum (VTE). Now the two companies presented a prototype panel in which both the bottom layer and the emissive layer were coated (the top layer was still deposited using VTE). The companies say this new process will reduce the cost of the panel to 10% compared to current OLEDs due to improved material utilization. They also say that the new panels will feature much longer lifetimes. Pioneer and Mitsubishi established a new company called MC Pioneer OLED Lighting (MPOL). The new company (jointly owned 50:50) will handle OLED lighting marketing and sales in Japan. MPOL offers Verbatim's Velve color-tunable OLED lighting panels (jointly made by Mitsubishi and Pioneer). MPOL has a nice website (in Japanese, though) that shows nice photos of the latest Velve installations such as the Issey Miyake store at Tokyo's JP Tower and the Kaiteki Cafe in Tokyo.